Now the children are settled and comfortable with their surroundings in the unit, the children are given the control to brain storm their ideas each week of what they would like to do. We hear everyone’s ideas and then we go with something that everyone agrees would be a good topic to do. This week we have been looking at lots of things to do with Dinosaurs! The children asked for a dinosaur cave where they have been looking for fossils. We have made our own dinosaur footprints by drawing around our feet and we have been very creative and made our own dinosaur paintings. We are now up and running with our phonics lessons! Each day we have a discrete phonics lesson where we look at a sound and learn an action to go with it to help us remember it. This week we have been looking at the sounds: s a t p. We have learnt from looking at these few sounds we can make a few words to read such as: at, sat, as and pat. We have also been learning some tricky words which we call ‘red words’. Red words are words that cannot be sounded out and we just have to learn them by sight. This week the red words have been: ‘I’ and ‘the’. When learning the sounds we have also been looking at how to write the sounds using cursive writing. Mrs Turrall writes it on the board for us and then we use our ‘magic pencils’ (our fingers) to air write the letter. We then practise writing the letter on a partners back so they can feel it being written. This week we have been revising one more and one less than a given number to 20 and we are getting very good at this. We did some revision of pattern also looking at what comes next in a sequence e.g. circle, square, circle... We looked at harder patterns too such as: triangle, triangle, square, triangle, triangle... We have been learning how to write our numbers using special number rhymes to help us remember how to form them correctly. We have also been singing some number rhymes such as 5 currant buns, 5 little monkeys and 5 little speckled frogs. 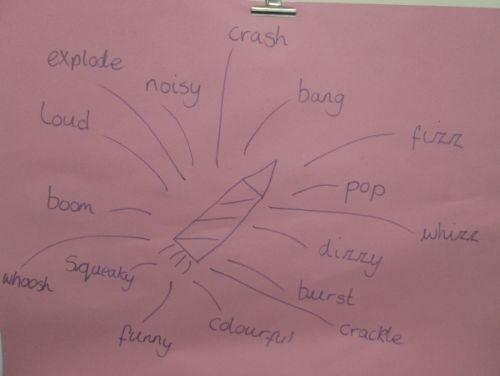 As part of looking at fireworks, as a group we thought about lots of descriptive words we could use about fireworks. We came up with some really good words as you can see below. This week we have looked at why we have Bonfire Night and learnt about Guy Fawkes and tried to remember the ryhme although that was quite difficult! We just learnt the first line: ‘Remember, remember the 5th of November. From this we made some rather spectacular firework pictures which you can see below. This week we have also been learning about the Hindu festival of Diwali. Mrs Turrall read us the story of ‘Rama and Sita’ and we looked at the celebrations that Hindu’s have for this festival. We found out that Hindu’s have fireworks as well for their celebrations as it is the ‘Festival of Light’. We looked at some lovely Rangoli patterns that are made to welcome Goddess Lakshmi to the family home. This inspired us to paint and colour our own Rangoli patterns. We concentrated really hard at doing this and they are beautful! We made a lovely display of them in our room. Here are some pictures of us making our Rangoli patterns. This week we were lucky to have a visitor into the class. A parent from Oak class kindly came in to show us how to do Mendhi patterns. We each drew around our hands and then tried to make our own Mendhi patterns on our hands. Again our hand paintings came out really well! We have been very creative this week. Here are some pictures below of our Mendhi painting. Do any Ash parents have a special talent or hobby they would like to share with the children of Ash and Oak? If so please do see Mrs Turrall as you are more than welcome to come in and share it! Lastly, we have been making poppies ready for Remembrance Day Assembly on Monday. If you are able to join us please do come along on Monday at 10.30am.